Developed over a century ago, and put into widespread use in the 1930s, mercury vapor lamps have been the workhorse of society. They are used in multitudes of applications, but you know them best as the illuminators of city streets and rural roadways and properties. These HID lamps provide safety and guide the way on a stormy night. But in recent years there have been concerns as to their energy efficiency as well as their environmental friendliness. This concern ultimately led to the passing of the Energy Policy Act of 2005. Though restrictions were placed on mercury ballasts, Mercury lamp use is still legal for the replacement purposes in existing fixtures throughout an enormous installed base. The US Congress passed legislation in 2005 known as the Energy Policy Act of 2005. First introduced in April 2005, this fast moving policy was passed by both the House and Senate in July and formally signed into law in early August 2005. Advocates of the Energy Policy Act of 2005 felt this law would officially combat and meet “head on” the growing energy challenges facing the US. This act changed energy policy as we know it by providing tax incentives and loan guarantees for energy production of various types. You will find in this 551 page E.P.A. document the statement that specifically prohibits the manufacture and importation of mercury vapor ballasts (but not lamps) after 2008. (Note: in 2003 Congress passed legislation that banned incandescent light bulbs in favor of mercury vapor compact florescent bulbs). According to the act, mercury vapor security lights are being phased out to “protect the environment” and to “promote energy efficiency” in lighting. As more efficient types of HID lighting fixtures have entered the market, mercury lamps have become less popular. Although the bulbs are still widely available, the United States banned the sale of mercury vapor ballasts in 2008. According to the ban, existing fixtures can remain in service but, as they burn out, they must be replaced with newer, more efficient lighting alternatives. Similar laws have been passed in the European Union, which set 2015 as the year when mercury lamps will no longer be approved for lighting purposes. What are Mercury Vapor Lights? A mercury vapor lamp is a type of high intensity discharge (HID) lamp that is typically used for commercial and outdoor lighting. It was the original metal vapor style of light fixture to be mass produced for general purpose lighting. The mercury vapor lamp works by creating an electric current to mercury vapor within a sealed glass jacket. 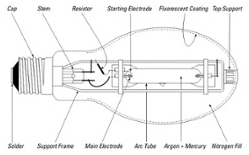 The bulb is comprised of an inner tube, called the arc tube, and an outer jacket (or bulb). As with fluorescent lights, mercury vapor lamps require a ballast to supply the proper voltage and regulate the current to the electrodes. The ballast is designed to be used with a specific size, or wattage, of bulb. Using a mercury vapor lamp with a ballast that was made for a higher wattage bulb might damage it or cause it to explode. Using too small of a ballast will result in lower light output and can shorten the life of the bulb. “T” type light bulbs have a self-extinguishing feature that shuts off the light within 15 minutes after the outer bulb is broken. “R” type light bulbs do not have a self-extinguishing feature. They should only be installed in light fixtures that are fully enclosed by a lens of glass or plastic, or used only in areas where people will not be exposed to UV radiation if the outer bulb breaks. Manufacturers of electronic radiation emitting products sold in the United States are responsible for compliance with the Federal Food, Drug and Cosmetic Act (FFDCA), Chapter V, Subchapter C – Electronic Product Radiation Control. Why are Mercury Vapor Lamps used? Mercury vapor lamps are used because they are dependable, with a long service life and have shown to be one of the longest running lamps with a good return on investment for commercial lighting. When used with the correct ballast and properly maintained, a mercury vapor lamp has a long service life. The average life expectancy is more than 24,000 hours, or nearly three years of continuous use. Mercury vapor lamps have found the greatest use in industrial applications and outdoor lighting, because of their low cost and long life, and lamp sizes of up to 1,000 watts. Because mercury lamps are so prevalent in the current outdoor lighting infrastructure, and still safe when properly installed in a serviceable fixture, the need for these products will continue for many more years.